An executive with the Kansas City Chiefs professional football team decided to diss, in a sarcastic, dismissive way, a lifelong Chiefs fan. He sent a Twitter message to a disgruntled fan who had vented about the team’s ownership on Twitter. In response, Wright tweeted the above image of the DM, with a comment about how it was a poor move for a major sports brand to diss fans. 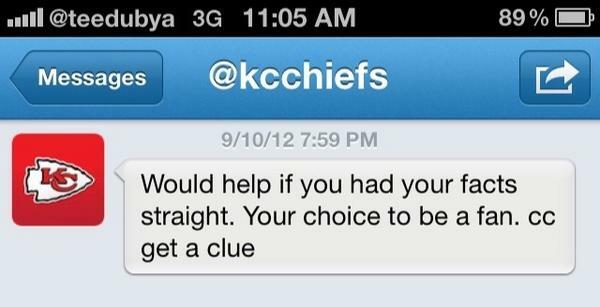 He thought the fuss would die — until he learned that the Chiefs had blocked him on Twitter. I apologize to the fans for my response to a tweet sent to me earlier. No excuse for my actions. I am truly sorry and it won’t happen again. Wright, however, did not see the apology until someone on Reddit told him about it. Why? The team had blocked him on Twitter. The rest of the team’s followers did see it, though, which led to more questions. The blocking and subsequent pseudo-apology only incensed Wright even more. “What’s funny is that I have 127,000 followers and they have 107,000, so they didn’t do any research on who they were dealing with,” he tells Mashable. The story continued to go viral, and by Wednesday afternoon, Wright had been a guest on several local TV and radio shows. Several national outlets, including Yahoo!, picked it up as well. He says he’s gotten some abuse via social media from fans who accuse him of blowing the exchange out of proportion, but that most people have given their support. On Reddit, reactions to his thread are 72% positive. So what’s the biggest takeaway for pro sports teams, here? Best to let fans vent. And, if you do engage in any banter, be aware of who you might offend. Social media influencers like Wright wield more power than many companies realize, and that new dynamic can burn a sassy brand. Wright says that as of Wednesday evening, he hadn’t heard from any Chiefs reps since the whole debacle began, but suspects they’ve learned a lesson. Did the dissed fan blow the social media diss out of proportion?